Yesterday we moved into our new apartment! Finally, I’ll have own office. And our place is much larger than my previous 700 square foot 1-bedroom. I’m so eager to get to Home Goods, Pottery Barn, Target plus go antique shopping. The upside of moving is that you get to completely redecorate. If I haven’t mentioned before, my style is very romantic with a bit of sophistication. I love antiques and making them new again with a fresh coat of paint. In fact, I recently had an old headboard painted a beautiful bronze gold from my friends at MegMade here in Chicago. They have a wonderful Etsy shop too, so check it out! Next up on my list of today’s talking points is this epic vegetarian sandwich that I made in partnership with my friends at Peapod. 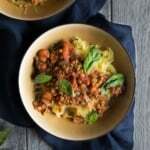 Like I mentioned in previous posts, Peapod asked me to create delicious recipes for their new website FromThePod.com, which I am completely LOVING! And what could be better than a sandwich that takes about 5 minutes to make? 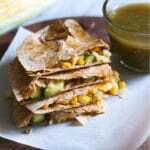 Especially one with creamy, ripe avocado plus protein and fiber packed chickpeas. Add a little bit of sweetness from cranberries and tang from lemon. It’s basically sandwich magic. Or salad magic if you’re avoiding extra carbs. 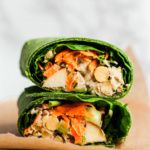 However you decide to enjoy this sandwich, I know you’re going to love it’s flavor and how easy it is to throw together for a healthy lunch. Now I’m off to look at paint colors… wish me luck! If you make this recipe, be sure to leave a comment below or snap a pic and tag #ambitiouskitchen on Instagram. I love seeing your creations! Have a great weekend. 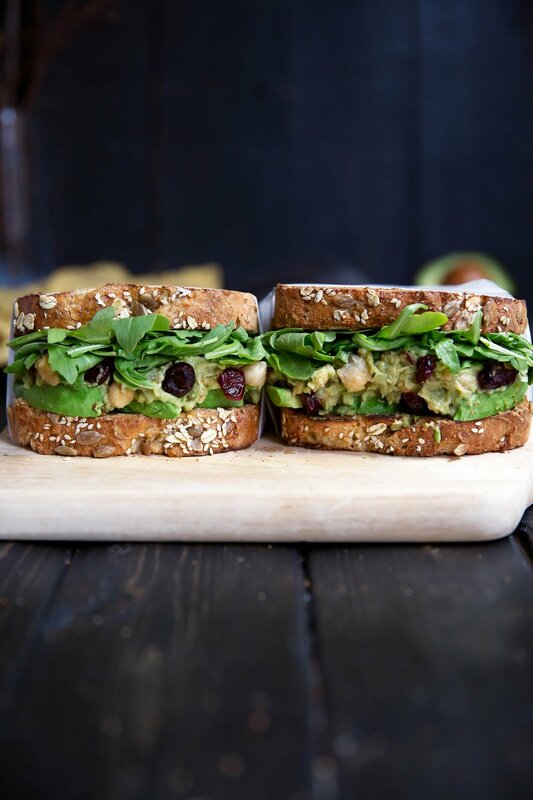 INCREDIBLE vegetarian smashed avocado chickpea salad sandwich. No mayo necessary thanks to the creamy, ripe avocado. Cranberries and lemon give it a nice sweet tang too! In a medium bowl, smash chickpeas with a fork. Add in avocado and use fork to smash again until avocado is smooth, yet still contains a few chunky pieces. Stir in lemon juice and cranberries. Season with salt and pepper to taste. Place in refrigerator until ready to serve (best within 1-2 days). When ready to serve, toast bread then spread 1/2 chickpea avocado salad over 1 slice. Top with arugula, red onion or spinach, if desired. Add other toasted slice on top, then cut in half and enjoy! The nutrition information does not include bread since you could put this on any type of bread or eat it on lettuce instead. To decrease the sugar in this recipe, reduce the amount of cranberries used to 1/4 cup. This post is sponsored by Peapod. All thoughts and opinions are my own. Thanks for continuing to support AK and the brands that help make this site possible! 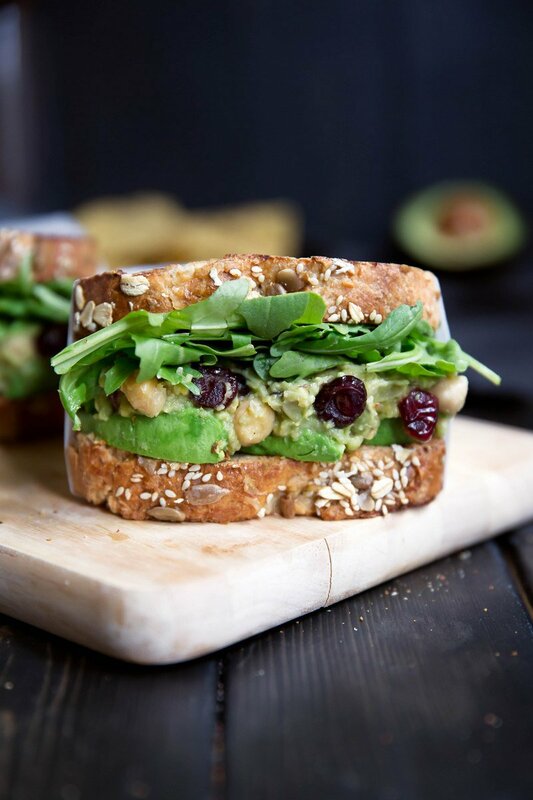 65 Responses to "Smashed Chickpea Avocado Salad Sandwich with Cranberries + Lemon"
I’m concerned about the amount of carbs in this sandwich, and from what I understand it doesn’t even include the bread in the count. I agree – for diabetics the carb count is way too much. The cranberries in here are a great addition! Love this yummy sandwich! 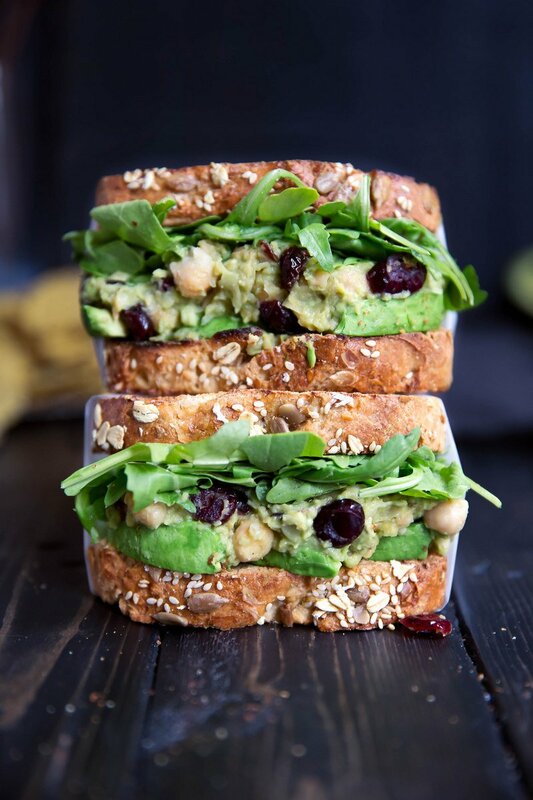 Chickpeas and avocado are two of my favorite foods, so naturally these sandwiches caught my eye! I love the addition of cranberries – it gives the sandwiches a slightly autumnal feel! I love anything with chick peas and this is no exception. Next I’ll have to try the Flourless Chocolate Chip Chickpea Blondies. Breaking new ground here. Thank you! I need this sandwich in my life! Would you add turkey or chicken to it too or would that just be too much? I think pulled chicken would be an awesome addition, but honestly it’s very filling on it’s own! Up to you! ah, congrats on the new place! having your own office is life changing! I’m totally loving hard on this sandwich, love the extra tang and sweetness from the cranberries!! Delicious! My kids and I stuffed it in a pita and ate it. Thanks for posting something so simple and yummy. 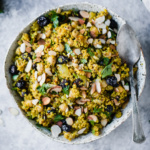 I just found this at 9 pm and can’t wait for lunch tomorrow so I can try making it! Thanks for sharing. Sound nourishing and delicious will certainly try and then make it a part of my special dressings. Looks great I am going to try this one. You paint antiques? I hope this is an american-ism and you mean you paint vintage items rather than good antiques!!! Added extra lemon and some mustard! So delicious!!!!!! So I added sunflower seeds for crunch ? The most recent comments are a couple years old now, but I hope someone can help me. I made this as directed. It took me quite a bit longer to mash the chickpeas, and my mixture was not green whatsoever. I’m new to the avocado game so I’m not sure how ripe it needs to be for the smooth, creamy, green consistency as shown in the recipe pictures on here. My avocado stem was easily removed, which I thought was the sign for ripeness. I would appreciate any feedback for this. 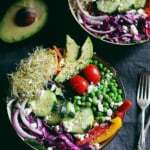 I added some goat cheese to this amazing recipe and it was unreal! love this! Been eyeing this recipe forever and finally tried it. Soooo delicious. Was in a rush so I left out red onion and did a pretty poor job smashing, but I did add some feta which was a wise choice. 10/10 would eat everyday. Yum!! 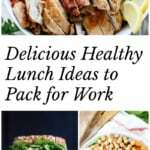 I plan to make this next week for us to take for lunch at work. I know it says that the mashed chickpeas and avocado are good for 1-2 days but my question is….does it turn to a brown mush? I want my husband to be willing to actually eat it if I send it! I planned on taking everything separately and assembling when ready to eat. Thoughts? 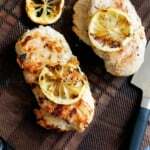 The lemon juice will help combat premature browning of the avocado, so I think it would be fine to prepare this in the morning if packing for that day’s lunch. Looks like one recipe is good for two lunches so you won’t have to wonder what the leftovers will look like next day. Maybe reserve a little bit and put it in the fridge to see how it keeps its green over the course of the day/next day. Super easy, ridiculous delicious-ness. This recipe is a keeper! This is so delicious! I had it on one piece of sprouted whole grain bread with a handful of arugula. I can’t wait to have some more for lunch tomorrow. I might throw it on a bed of kale with some peppers, celery, and tomato and make it a super food salad.